Nothing sounds quite the same. 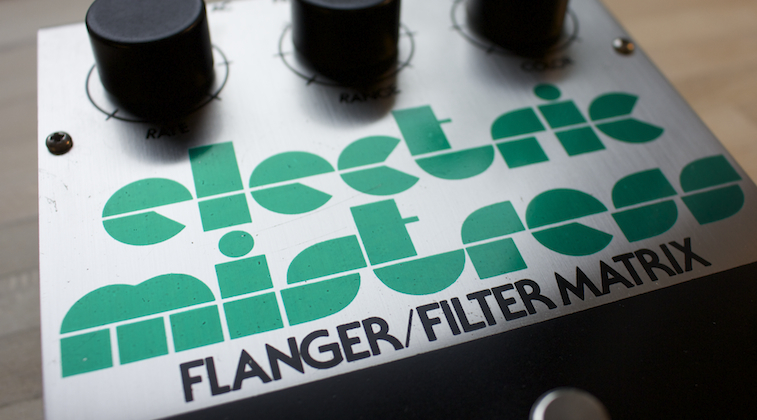 The Electric Mistress flanger is unique and it has been featured on countless recordings since it hit the market in the late 70s. 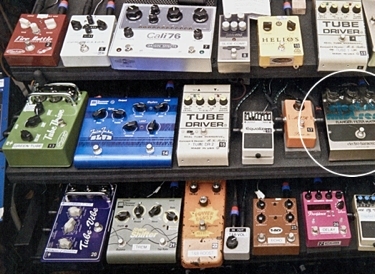 The pedal also defined David Gilmourâ€™s tones between 1977-83. A period many consider to be the peak of Pink Floyd. In this feature weâ€™ll dig deep into the magic and legend of the Electric Mistress. The Electric Mistress was designed by David Cockerell (Electro Harmonix). The first model appeared in early 1976. David had worked for EMS, where he designed the worldâ€™s first multi effect – the Synthi Hi-Fli (used by David Gilmour during the Dark Side of the Moon era 1973-75). Later, with Electro Harmonix, David also designed the Small Stone phaser and Micro Synth, among others, which were both based on the Hi-Fli. Flanging refers to a tape reelâ€™s flange or rim. The effect dates back to the mid 40â€™s (Les Paul was one of the first to use it) but it was commonly used in the 60s and 70s by many bands and artists. Flanging is achieved by playing back a recorded signal from two tape machines operating simultaneously and slowing down one of the playback reels about 20ms while recording onto a third machine. This slight delay caused a flanging effect – a swirly, metallic jet type of sound (listen to Lucy in the Sky with Diamonds). Slowing down even more would produce a chorus effect and ultimately a fast slap back delay. Flanger pedals hit the market in the mid 70s. The pioneers being the ADA Flanger, Tychobrahe Pedal Flanger, MXR Flanger and the Electro Harmonix Electric Mistress. None of these actually sound like the tape flanging. They often tend towards a chorus or more defined jet sounds, probably because this is considered more musical or better suited for guitar. The Deco made by Strymon is one of the few that is designed to capture the true tape flanging. The first generation Electric Mistress pedals were produced between 1976-81. These were housed in Big Muff sized boxes powered by two 9V batteries (the 1981 version powered by a single 9V). Graphics and schematics changed over the years but the tone stayed more or less the same. These early versions are known for their liquidy character and chorusy flanging. They were also known for being very noisy (even when they were switched off) and they had a nasty volume drop when engaged. Like many of the older Electro Harmonics pedals, vintage Electric Mistress pedals are subject to inconsistent use of parts with varying quality. Two seemingly identical pedals can sound very different. Be aware of this when considering buying a vintage Mistress off EBay. Check out the Electric Mistress Mystery Page for more details on each model. 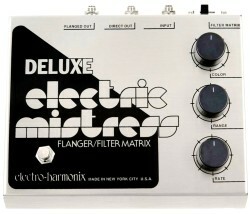 The Deluxe Electric Mistress was designed by Electro Harmonix engineer Howard Davis (who also designed the Deluxe Memory Man). It was offered along side the original Mistress between 1978-81 and later reissued in 1999 (to present) presented in a slightly larger box. Graphics and schematics changed over the years but the tone has stayed more or less the same. The Deluxe is featured a noise filter, making it less noisy than the original Mistress. It has a slightly more jet-like tone, like the MXR, with a hint more mid range and low end. The current large box Deluxe Electric Mistress has a considerably darker and less transparent tone compared to the original 70s models and the 1999 reissue. David Gilmour must have been one of the first to use the Electric Mistress. At least to the extent that he did. Although not featured on the Animals album, a â€™76 green logo V2 (second generation) Electric Mistress can be seen laying on top of his Pete Cornish pedal board during the tour rehearsals at the Olympia Exhibition Hall, London, UK in late 1976. Pete Cornish performed extensive modifications on the board after the Animals tour, in October 1977, and built the pedal into the board. Although not confirmed it is fair to assume that Cornish modified Davidâ€™s Mistress pedals to eliminate noise and volume drop. David Gilmour’s pedalboard designed by Pete Cornish pictured at the tour rehearsals at Olympia Exhibition Hall in London, UK, in late 1976. A green logo V2 1976 Electric Mistress is seen placed on top of the board, connected via send/returns on the board. The pedal was later built into the board and used for David’s 1978 solo album, The Wall album and tour and Final Cut. Notice also the ram’s head Big Muff to its right. During the 1977 Animals tour David would use the Electric Mistress together with a (ramâ€™s head) Big Muff on songs like Dogs and Pigs in conjunction with his amp rig consisting of a blend between Hiwatts and Yamaha RA200 rotating speakers. The Electric Mistress was extensively used on David Gilmour 1978 solo album – notably on Mihalis (rhythms and solo), So Far Away (solo), Short and Sweet (main riff and rhythms), Raise My Rent (solo) and I Canâ€™t Breathe Anymore (rhythms). The album is really an early show case for the pedal and Davidâ€™s late 70s tones. David’s pedal rack pictured (2015) in his new home studio, Medina, located in Hove UK. Notice the Electric Mistress on the middle shelf to the right. Although looking slightly blueish, the logo is actually green as the mid 70s Electric Mistress pedals. Although only briefly used on the recording of The Wall (mostly used as an effect on panned guitars and occasional licks), the Electric Mistress was once again used extensively during the The Wall tour in 1980-81. David had two pedal boards on stage – his main 1976 Pete Cornish board and a mini board, also designed by Cornish, used while performing outside the wall during the second half of the show. Both boards featured an Electric Mistress. Davidâ€™s Wall stage setup featured his Hiwatt amps, WEM cabinets and two Yamaha RA200 rotating speaker cabinets. During the 1981 leg of the tour, he also used two Boss CE2 chorus pedals for stereo spread. All this combined with the Electric Mistress. The amount of modulation borders to being ridiculous but it really defined his huge tone for that tour and songs like Mother, Comfortably Numb and Run Like Hell. Final Cut (1983) is perhaps one of the most honest sounding albums in terms of David Gilmourâ€™s guitar tones. Very little studio processing was done to the tracks and the Electric Mistress can be heard throughout – notably on Fletcher Memorial Home (solo) and Not Now John (solo). David’s Rattle That Lock stage rig feature a vintage Electric Mistress linked with a Lehle parallel L for volume boost. The Mistress was used, with a Big Muff, on Comfortably Numb. Davidâ€™s exhausting 1994 stage rig did also feature an Electric Mistress. It was built into a custom rack by Davidâ€™s long-time technician, Phil Taylor. The unit also featured two Boss CE2 and a Demeter Tremulator. It is not known whether David actually used the Mistress during the tour or not – although Pulse and available bootlegs from the tour suggests that he never used it. Davidâ€™s new home recording studio, Medina, in Hove, UK, feature a large collection pedals, including an original Electric Mistress (probably a 1976-78 V2-V4 model). A vintage Electric Mistress (the one seen in David’s studio?) is also featured in David’s 2015/16 Rattle That Lock stage rig. 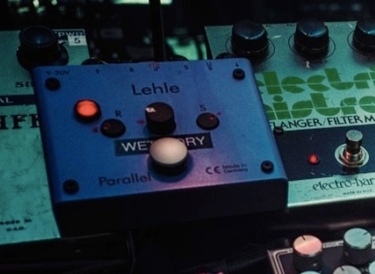 The pedal is linked up to a Lehle parallel L, which operates as a volume boost to compensate for the Mistress’ slight volume drop. The Mistress was used on Run Like Hell and, in combination with a Ram’s Head Big Muff, on Comfortably Numb live performances. Check out the David Gilmour Album Gear Guide for complete setups on each album and tour. Flanging is not a subtle effect and some find it too overwhelming – especially for replicating David Gilmourâ€™s tones. But, thatâ€™s pretty much the nature of the effect. Chorus, although sounding slightly different, is a more subtle effect. When replicating David Gilmour’s tones itâ€™s also important to understand the difference between when he used rotating speakers, the Mistress or both. It may not be that easy to tell the difference but the intro lick on Mihalis is the Mistress alone, while the intro on Raise My Rent is the Yamaha RA-200 rotating speaker. Most of his lead tones on the Is There Anybody Out There live album is both the Mistress and Yamaha. Here’s my favourite settings for each model. I prefer a slightly more jet kind of tone. You may want to adjust this slightly for a more airy Gilmour tone. NOTE that my 1977 Electric Mistress has 50% at noon. The potentiometers vary from model to model. Like most modulation effects, the tone you get from the Electric Mistress depends on what pickups, amp and other effects you use with it. Brighter amps, like Fender, and low output pickups adds a high end sparkle and a more noticeable swirl. On darker amps, like a Hiwatt, the Mistress produce a more mellow tone that also blends much better with Big Muffs and fuzz pedals. This combo is naturally the closest to Davidâ€™s 1977-83 Mistress tones. Combined with pedals and pickups that has a boosted mid range, like Tube Screamers, Rats and humbuckers, the Mistress appear darker and even a tad boomy, although this combo often works better on smaller amps and typical bedroom setups. The Electric Mistress can produce anything from subtle tape-ish flanging to more extreme rotary tones. David Gilmour seemed to prefer something in between. I prefer the Deluxe over the original Mistress. Part because I find the original to be too noisy and thin sounding but Iâ€™m also partial to a slightly more jet kind of flanging. Keep in mind that the original 18V Electric Mistress had differently positioned pots. That means that 50% effect is not always at noon as you’d expect but alternating between 3, 6 and 9 o’clock. See the Electric Mistress Mystery Page for the different pot ranges for each model. See picture above for my favourite Electric Mistress settings and the featured YouTube shootout clip for Animals, Wall and rotary settings. There arenâ€™t that many clones of the Mistress on the market. One of the reasons is that the SAD1024 chip used in the original models is hard to come by in large and affordable quantities. Some have tried though, with varying success. However, all the quirky little things that one often want to modify or change – noise, tone loss, hardwire bypass etc – are also what makes the mojo and a perfect clone might not be that perfect after all. 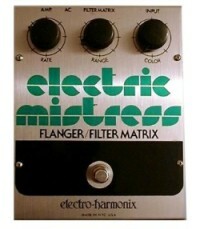 Although no longer made, the Hartman Analog Flanger is one of the very few clones of the original mid 70s Electric Mistress. Its authentic sounding, with the same airy character and theyâ€™ve managed to filter most of the noise and fix the volume drop. It also feature true bypass. Like the original, the Hartman sounds great for cleans but a bit thin and sometimes harsh with high gain pedals. The Mooer ElecLady/E-Lady, although cheap and incredibly small, offer perhaps the most convincing replication of the Electric Mistress tone. Itâ€™s closer to the Deluxe, with a distinct jet flanging but it also has some of that airy character of the mid 70s Mistress. The Donner Jet Convolution is also worth checking out. It’s actually a clone of a clone – the Mooer ElecLady – offered in the same mini pedal format. The price is $30 from China. 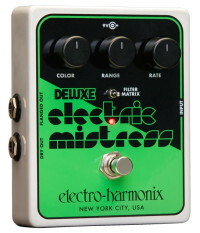 Not a clone as such but Electro Harmonix recently released the Deluxe Electric Mistress in their smaller case XO series. This upgrade deals with the volume drop and of course the smaller footprint is a bonus. The tone is close to the bigger box Deluxe only more chorusy. It seems that Electro Harmonix are more interested in offering an exhausting range of pedals rather than cloning their own vintage models. The ElecLady is in my opinion a better buy. In recent years, Electro Harmonix has also released other versions of the Electric Mistress – Stereo Electric Mistress and Neo Mistress. These are spin-off products that has little in common with the original Mistress and Deluxe models. Please use the comment field below and share your thoughts and experiences with the Electric Mistress! Do you have a recommendations on settings for the XO Deluxe Electric Mistress? Would it be similar to the posted Older Deluxe settings? To be very honest I haven’t found any settings on that one that sounds nice. It’s a good flanger, I’m sure, but it’s not a Mistress. Sorry. Do you know what version the Mistress is? OK. The V5 is a bit darker sounding than the original model an the ’99 that I use. There should be some trim pots inside but I don’t know if you should fiddle with those. If you think it sound dark then maybe you want to check out other versions, like the excellent Mooer E-Lady. Anyway, the settings suggested in this feature should be a good start. I just got one and its really good. Mine has some clipping/distortion when I strum chords on bridge into clean amp though. Also lops off some bottom end. Does yours clip/dostort a little? I’ve got one coming next month. Can’t wait to try it out. Enjoying my Elec Lady though. This longamp Roxanne was an impulse purchase, but mainly curious. I’ve read some reports of very slight internal trimmer adjustments to improve tone, but haven’t read anything about clipping and distorting. Is that bridge pickup you’re using really hot? Hi Bjorn, thanks again for sharing such wonderful work and thoughts. I was wondering if you had the chance to try and compare the MXR micro flanger, the one with only 2 buttons? Hi! Sorry for mt very late reply… It’s great but perhaps better suited for that Van Halen jet-type tone and not so much Gilmour. You’re right, thanks again Bjorn !! I have the last big box version of the DEM (V5?) and to be honest I’ve never really got on with it. On your recommendation I got a Mooer e-lady and I’m really happy with it, much better than the EHX (to my ears). How are you!! With the original mistress and hartman discontinued i think you need to hekp us with more/ other options for flangee pedals! Well, there aren’t that many out there. The EHX models doesn’t really compare with the older models and to be honest, the Mooer ElecLady does a very fine job. When it comes to the electric mistress should it be placed after big muff and over drive (but before delay) .. or before gains and everything else..
Iâ€™m referring to the mother solo. David had his after the gain pedals and before the delays. This is the common way to place chorus and flanger but there are no rules. 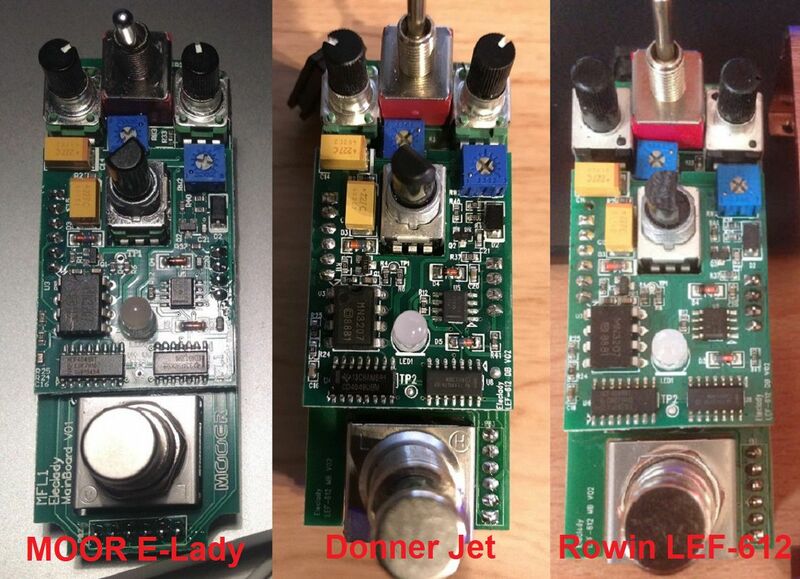 Looks like the Mooer ElecLady Flanger is sold under different labels for different prices, including Donner Jet Convolution Flanger & Rowin LEF 612. Hmm,, I wonder what those tweaker pots do! I have a few questions. The first is, How is the DEM V4 with the misprint? I can get one for a pretty good price, but wasn’t sure it was in the range of the so-called good ones. The second question is about the TC Electronic SCF (Chorus/Flanger). I have read some great reviews of it and it has been around for 30 years. It is analog for both chorus and flang. Are you at all familiar with this pedal. The sounds on the video clips are good, but then again they often are. Can it do what the Mistress and DEM do for Gilmour tones? As far as I know, the misprint model is the same as the later V4. They only changed the error on the box. The SCF is a classic and well worth checking out, I wouldn’t say that the flanger is dead on a Mistress but the chorus is super sweet. What do you think? This is a fantastic new entry! I have seen the gutshots of the above pedal and of both versions of the Hartman (one with the SAD1024 and one with the MN3007). All of them appear to be clones of the 9V (version 6) Electric Mistress from 1981. They are not clones of the original 18V (or rather 12V) version used by Andy Summers or David Gilmour. The version 6 actually has better designed (quieter) clock circuitry than the earlier versions, but the audio path let’s through noticeably more low-mids than the original. It also controls differently. The original can produce large sweeps at fast rate. That behaviour was tamed in the version 6 at the expense of pitch warble at high rates. Having said that, for most settings it won’t make much difference, and letting through more low-mids could be a plus, depending on what you are feeding it. hello bjorn: what do you think? Sure the mistress XO is not suitable for the tone Gilmour? regards! Well, this guy’s playing is superb! I can only judge the pedal from my own experience and I found it hard to dial in that smooth liquidy tone that made me fall in love with the Mistress 20 years ago. The XO sound a bit too overwhelming and hard to tame for my taste. Teh Mooer ELady is closer in my opinion. I recently got an early 1999 Deluxe reissue V4 that has the misprint and internal transformer. I`m sure the knobs have been removed at some point in time and I don`t think they were put back in the correct position. Can you tell me where the knobs should be pointed when they are turned all the way counter clockwise? If you look at my 99 in the clip, the range is all the way down or off. Not liking the Electric Lady at all. I love my Deluxe Mistress. my name is Marco, new here. Thanks for your very accurate tips on this subject. I haven’t opened them up but I have both and to my ears they’re identical. It’s a real shame that XO series DEM doesn’t quite capture the essence of the earlier versions. It seems everything is turned up to “11” on it. Rate really only has one usable setting (7:30-8am), Color is just always too heavy and saturated. and I’ve resorted to playing around with the trimpots. I’ve found some good tones doing this, but by no means am I an expert. Any way in which you might be interested in returning to this question and perhaps offer some recommendations on how to adjust the trimpots on the XO series to get as close as possible to the ideal Mistress sound? I don’t own the XO Mistress myself so I can’t really comment on the trim pots. I know some claim that a bit of tweaking helps but again, I’d have to experiment with that myself. Out of the box I wasn’t very impressed with the pedal. Sounded more like a chorus than a Mistress to me. I have a mid-2000s version of the DEM and recently bought (and promptly returned) the XO version. Almost any combination of knob positions on the big box Dlx yields musical results but the XO version sounds too over the top…the sweet spot for the XO is for all 3 knobs to be below the 9:00 position. That’s it. Perhaps at 24v, the big box has more headroom. The XO was a major disappointment. I guess I keep rolling along with the big box Dlx, then. Hey, (Bjorn I think) I’m looking for a way to get that nice tone from animals and I thought that a rotary speaker substitute would be a good option. I’m thinking about the electric mistress deluxe. First post, thanks for this website! Cheers! I think the Boss RT20 is the best way to simulate those rotary sounds. It has that chorusy flavour and you can control the amount of the effect. Other rotary sims has a more tremolo sound, which is more authentic but not that suited. The Mistress is much more dominating and although he did use one extensively on the Animals tour it is a different effect compated to a rotary. I haven’t seen or heard anything regarding the original Mistress that’s in David’s current board. Cornish has mentioned that he did do some minor improvements to a similar pedal that David used during the Animals/Wall era but I’m not sure whether this is the same pedal as he is using now. Probably not, as the old one was built into a Cornish board. The old circuit was too small to have room for a noise filter but it’s fair to assume that they’ve addressed this. Also, David’s 94 rig did feature a Mistress that guitar tech Phil Taylor built into a rack unit. This one had a custom noise filter. The mooer elec lady is the same the electric mistress 1981. Is not reissue de luxe electric mistress. Sound is very different! I think they all sound very similar but he’s comparing the pedals with the same settings on each, which is a bit misleading as each of these models has different aligned pots. In this clip that I’ve recorded, I managed to get very similar sounds with the ElecLady and Deluxe with different settings on each. My conclusion is that the ElecLady does a very good job at replicating the sounds of both the small box and Deluxe. Bjorn, have you had the chance to try the Moog MF Flanger? I wonder how that would perform. Have you tried the strymon deco to replicate those tape flanging effects? Yes, you can get some nice chorus tones with it but the flanging is not that suited for Gilmour’s tones… great sounding tape flanging though. I’ve just done a video comparing the Vintage Deluxe Electric Mistress with the new XO model. I found both to be quite excellent. I’m not quite hearing the massive difference but maybe it varies from unit to unit? The Range knob does a LOT! Turn it all the way up, pull the Color all the way to zero and set the rate to taste and you have a superb Chorus pedal. This applies to the ELady as well. I’ve tried them all, my favorite is the Hartmann. A problem I have with all of the flangers (and that I really would like to get rid off), is the very thin sound when combined with a muff (which I also tried a lot of). Especially the higher notes seem to be “dying” in a very thin, spikey sound. I’ve tried muff into flanger and reverse but I can’t get rid of it. Do you recognize this and do you have any advice? That’s true with the original early version, which the Hartman is a clone of, but my experience with the Deluxe and clones like the Mooer ElecLady is that they work very well with distortions and Muffs. Hi Bjorn, I recently bought the New Mooer E-lady Classic Analog Flanger & compared it to my Hartman Flanger. I found that the Mooer gives more lower end bass sound than the Hartman. Switching between the two of them the Hartman sounds thinner and has a more midrange/upper sound which is the sound I have been used to, so just wondering if this is something you have found also that the Mooer gives a slightly duller deeper sound? I have used your recommended settings on the Mooer but a bit puzzled at the result! Hi Ross, yes they are different but keep in mind that they are based on two different Mistress models. The Hartman is a version of the late 70s Mistress, which had less low end and more of that swirly flanging, almost chorusy tone. The Mooer is closer to the Deluxe Mistress, which is darker and perhaps closer to the MXR. Honestly, I’m in the process of re-purchasing a Hartman. I believe mine was a “second run” with the Panasonic chip, but it sounded absolutely perfect, I stupidly sold and later bought an E-Lady, not even the same ballpark, imho….I use it primarily for early Lifeson stuff, but it was spot on for Summers and later Floyd, especially Final Cut. They’re hard to find and not cheap, but anyone really serious about this soubd will appreciate its accuracy and unmatched musicality, it’s truly heavenly…I don’t buy old beat up “classics”, too unreliable and inconsistent as has been mentioned, buy the Hartman! Hi Bjorn. I just picked up a Deluxe Mistress XO today. To be honest, I quite like it at some settings. However, with the Range and Rate knobs raised above 10 o’clock, (with the color below 12 o’clock), it immediately starts to sound weird. Kinda detuned (?) – I’m not sure if I’m describing it right. Is this normal, in your experience with this particular pedal? Regarding the third part of your video ( “Deep Chorus flanging with Big Muff” ), do you think I can get that tone of Mother’s Solo( amazing by the way) with a analog chorus pedal ( like a Mooer Ensemble King) instead a Eleclady Flanger? That’s because a chorus pedal is perhaps more versatile, also for other genres and tones…and I may have to choose which one to buy. On the other hand, be able to nail that David’s Tone ( Mother’s solo) is very important to me. What do you recommend? Thanks a lot. Since you mention that the tone is important for you to nail, I would say no. A chorus can be a good replacement for a flanger but it sound much more subtle and it often has more mid range, making it sound darker. Depends on how picky you are. For THE tone, I would definitely go for the ElecLady. Thank you very much Bjorn. 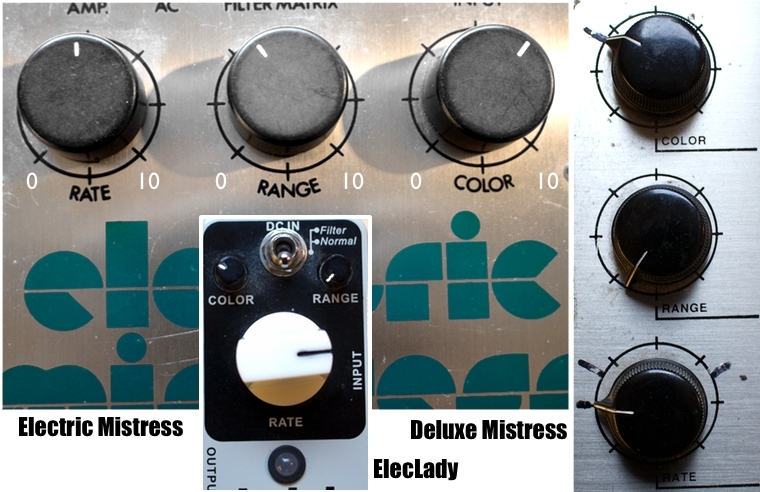 Hey Bjorn, in your “Favourite Settings” photo of the Electric Mistress, ElecLady and Deluxe Mistress; do these different knob settings yield a similar sound between all three pedals? Or do you have a different sounding favourite setting for each pedal? Just checking out the Mistress Mystery page and noticed how each one has different positioned pots and pot tolerances. Thanks Man! Hi Bjorn, I`ve just bought Electric Mistress Filter Matrix Deluxe from EBay, so it should arrive soon. It is an 80s Mistress above you mentioned the mid 90s are the ones to look for. Will the 80s one do a better job than the current models. Cheers Stuart. I’ve tried MANY different Mistress pedals and they all sound a bit different but yeah, the early Deluxe models sound closer to the ’99 than the current. Hello! Between a original Electric Mistress and a clone which you do you think is a better buy? If it is a clone, which? The Mooer ElecLady is definitely your best buy. The price should fit any budget and it sounds really good. The current Mistress offered by EHX doesn’t sound like the old ones and buying a vintage unit off EBay is risky business… you never know what you get. Those old EHX units doesn’t stand the test of time very well. Would be great to try the new Source Audio Mercury Flanger to see if we could achieve Gilmour Flange tone… Probably in fact but who knows! I haven’t tried it so I can’t tell. The demos sounds great but I haven’t heard any Mistress tones yet. Hi Bjorn. Have you tried the tc electronic Vortex flanger? They reckon it can sound like a Hartman/ mistress. If it can, with a tone print library too. Might be a good buy. I need a flanger. Thanks for the info! I didn’t try adjusting the trim pots. Hi Bjorn, I have a 1999 Electric Mistress Deluxe version 4 with the round power cord. The problem is that the bushing that holds the cord in place is missing and I can’t seem to find one. I even called Electro-Harmonix tech support and they had no idea where I could get a replacement. Do you have any idea where I can buy one? Thanks! If by bushing you mean the black nylon bushing that surrounds the cord, and your cord is just sitting loosely in the hole in the metal box, you should be able to pick them nne up at any electronics supply house. Take the pedal with you, as they use two measurements, the hole, as well as the guage of cord. You might even find one at Radio Shack, but I’d check for local suppliers that cater to techs. I have a ton of them, but don’t they’re the right size. I think you should be able to find one in no time at all! Thanks for your suggestions, I’ll let you know if I find one and where to get them. Thanks Keith! I think they all have different qualities. Personally, I like the Deluxe better too but although the original Mistress sounds thin, there’s something about that tone that’s instant late 70s Gilmour :) I would assume that his was modded. Hi Bjorn, i have one doubt. In your video how did you power your green logo mistress?? With two 9v batteries didn’t you? I would assume that. The thing is i’m buying a green mistress myself and i don’t want to use batteries. What’s up with the little plug that is between the IN and OUT jacks? Thank you. Greetings from Argentina. Your site is great! Hi Joaquin. Yes, I power mine with two 9V batteries. I’ve never tried to power it with an adapter but I think you can use a mini jack converter for the small hole. Try it… I’m not sure. Hi Riis … still enjoying your record Lullabies … my quetion is: could you suggest me a setup for a gilmourish sounding Hartman flanger? Thanks, Carlos! I don’t own one myself and it’s been a while since I played one. I do remember that having all the controls around 10:00 o’clock (you might want to tweak that slightly) was a good start. Bjorn….really great post. You should do more comparison videos with in depth observations. I really think it would really help a lot of people. I use the DEM for Gilmour and Summers. Great tone but definitely had a few deficiencies. Thank you for the article! This is actually my first post on here. I love this site! One of my favorite Gilmour tones actually comes from “Dogs”. Around 7 minutes and 30 seconds into the song their is this funky rhythm guitar that comes in on the “and its too late to use the weight you used to need to throw around…” verse. So my question, is there a mild flange on that guitar part, the electric mistress? I love the tone but am unsure what exactly I am hearing. Thank you so much! Hi Nate! Thanks for posting! David recorded Dogs with a Telecaster that was split between a Yamaha RA200 rotating speaker and a Hiwatt. He also used a Big Muff for the solos. The part you’re referring to is the Yamaha. As far as I can tell, there’s no Mistress on Animals. Most of David’s guitar work was also recorded before or simultaneously as the Mistress hit the market, so it’s very unlikely that he owned one until very late in ’76 as we can see for the tour rehearsal pictures in December. that part is hauntingly amazing. i look forward to that rhythm part every time i listen to that song. waters once did a version of animals with another band in the 90s and despite there being like more than twice the amount of musicians needed… they kind of skipped over that funky part. it finally confirmed my belief that while roger waters is an amazing composer. he never truly did realize what an alchemist gilmour was. that part blows my mind every time i hear it. First of all, I’d like to congratulate you for this excelent website! I always learn something new whenever I come here! I never played original Mistresses but I do have one the earlier Hartmans with the Reticon chips in it. I’m not a Gilmour fan, but I dig early Police and early The Cure (I believe they used a Mistress on their second album, “Seventeen Seconds”). 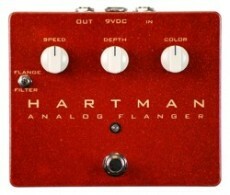 My experience with the Hartman Flanger is exactly what you described: it sounds like what I hear on those records, but can’t handle higher gain distortion and powerful pickups – even when using a 12-volt adapter, which was a suggestion from Mr. Hartman himself. Whenever I want to use a flanger with humbuckers I reach for my A/DA Flanger 2009 reissue. Thanks for your kind words, Felipe! I’ve tweaked with the mooer a lot, but i miss the sweetness of the deluxe mistress. It’s too harsh for me. But i had the chance to put my hands on an 83 Ibanez FL9 wich works perfectly, and with it’s 4 knobs i was able to get the tone i was after. Highly recommend that pedal! The ElecLady can sound pretty bad, at least for David’s tones, if you don’t hit the sweetspot. I’ve found that the range needs to be all the way down and the colour just above 9:00. The rate knob is also very sensitive. I’ve set mine to around 2:30 and it sounds pretty good. I’m really happy that the ElecLady did so well, as I got the same results. I have a nice Deluxe EM, and the ElecLady is pretty darn close. The DEM is a little sweeter, but you have to really listen to hear it. It’s hard to tell them apart unless you do a A/B comparison. Last fall I bought an Empress Nebulus modulation pedal and I am very pleased with it. It can do phasing, vibrato-leslie and flanging very well and an added plus (for me at least) is the mix control. It really helps with C-Numb, The Thin Ice and Another Brick In the Wall 1 and 3. Just something you should check out. Firstly what an awesome website!! This is my first comment although I’ve been using this site for a couple of years now. It has helped me enormously in learning about tone and how to create a “Gilmourish” sound. I have been thinking about purchasing a Mooer Electric Lady as I have been getting by with a Boss chorus pedal but after reading this guide I wonder whether I’d be better getting a rotary sim? Just thinking this may cover a wider spectrum of David’s sound. I just play at home, have a Gilmour Strat, R9 Les Paul and have a Fender Super Champ X2 and Marshall SL5. It would be great to get your advice Bjorn. Ps, which is the better sim the Lex or the Boss?? Hi! Great Mistress writeup + demo, it’s just what i have been waiting for! :) After trying all the models (bar the XO EM), i still love the 18V original the most. The issue is the volume drop (fixed by my G2 looper), the massive bass-cut + excessive treble added. Other than that it is the most amazing, liquid sounding flanger! Thanks! Yes, the volume drop is nasty but you can definitely hear the more authentic Gilmour tones with the Muff especially. Great post about The Mistress. I agree that overall the deluxe sounds the most pleasant. I can’t tell for sure, but it looks like the DEM you are using here has an adapter input. Is it a reissue or are you using a more current model? Nonetheless they all sound great in their own way! Thanks for the hard work, Bjorn! Yes, mine has an adapter. It’s a 1999 reissue. The US models had the power cable but I think they sold them with the adapter in Europe to match the different voltage we have over here. Hi Bjorn. I thought I’d chip in and say that the Donner Jet Convolution is great. Unless I ever get my hands on a vintage Mistress, I’m happy with this one, even though it’s a cheapie Chinese clone. It’s also good dialled in for more of a chorus sound – I’m even thinking of getting a 2nd one, and experimenting with setting one for chorus and one for flanging. I’ve also experimented with running it through a Boss LS-2 to get volume and blend control (as per the Mystery page’s mod section). The Jet Convolution is great with dirt too. I highly recommend it! I have the monoprice branded version of the donner, and for the size and cost, its hard to beat. I prefer phase to flange but given how little room this takes up it is not going anywhere. It’s funny that you talk about overwhelming modulation. A friend of mine who is a great guitarist saw my Floyd act once and complained afterward that during the Wall stuff I had too much modulation… Clearly he had never heard the live cuts from that era! To be fair, I was using a non-Deluxe Mistress split between two Hiwatts and an RA200, with one of the Hiwatts having a CE2 in the chain to accentuate the stereo. Wounded great to me. Huge and powerful. That first note of the C Numb solo was ridiculous. As for the Mistress, I had mine modded to non-Deluxe specs by Howard Davis and I fully recommend that everyone do the same. Totally changed for the better. Wow, that must have sounded awesome! Very nice explanation of the differences. I hoped you would talk about the stereo electric mistress as well, which I own as a part of the EHX Epitome (Pedal that features the Holy Grail, Stereo Electric Mistress and POG). What do you think about the Stereo EM? I didn’t include the Stereo and Neo because I don’t think they are representative of the Electric Mistress tone. They’re closer to chorus, which I guess was the intention with the design as well. Hi Diego, I had the same idea for the stereo electric mistress and thought well we got a choice of flanger and/or chorus and also the filter effect can be usefil so its not all bad. I love, LOVE this article. I have the “green” logo deluxe mistress from the early 80s and it sounds great. I’ve been using it with my tube driver a lot. Sounds great together. I’m very surprised to know that raise my rent is the mistress though…I always thought that was the yamaha for the solo. It’s hard to tell them apart at times. If you listen close to raise my rent and so far away, it sounds like he may have used different settings on the mistress. I personally like the sound of the yamahas in solo more. Like on final cut or dogs. Then again they sound a lot alike and both produce great tones. Again, GREAT article! Thanks! If you listen to those solo ’78 in a headset then the sounds gets easier to tell apart. I love his tones on that album but they are a bit darker and muddier than Animals and Final Cut. The Yahama sounds more chorusy while the Mistress has that slight jet swoosh… Of course, mic placement makes a huge difference for modulation tones. I’ll have to check them out with headphones. I agree about his solo album being sort of muddier. Personally, the final cut is my favorite because like you’ve said, it’s more honest sounding. Animals is my second favorite.I like his mistress tones but the yamaha has always been my favorite. I just hope he uses his yamahas on his next album and tour! That would be great! It’s all over the new recordings on Endless River.